We all experience discomfort at one point or another in our lives. And many people have been experiencing some intense discomfort lately. One of my favorite methods of healing discomfort is through wise and loving communication. It is truly amazing to experience healing peace, calm, and harmony within yourself and your situation. And this is accomplished when the energies creating discomfort are listened to, honored, and respected from a place of wisdom and love. Are you experiencing symptoms of discomfort or dis-ease? Would you like to experience a new kind of healing? Through wise and loving communication, you can open to the relationship between the symptomatic energies interacting within yourself and your situation and you can get to the cause of the conflict or contradiction between those energies. Give it a try! Attune to your symptom. Listen to, honor, and respect what is being communicated. Even if you don’t like what is being said, when you come from wisdom and love, you will sense, feel, hear, and/or know what needs to come up. What are your symptoms telling you? What do the energies within yourself and your situation say is the problem, issue, conflict, or contradiction? The energies creating your discomfort and dis-ease will respond to you when you ask and when you listen from a place of honor and respect. And as you listen and dialogue with honor and respect, the energies within yourself and your situation listen and dialogue back. What would you like to say to the energies in discomfort? After you truly listen, sense, feel, and hear them, by all means respond back to them - communicate your honest thoughts and feelings. Express your judgments and expectations. Express your fear, your anger, your compassion, your understanding - and remember to include your wisdom and love. Your heart is a great place to find your deepest wisdom and love. You will be amazed at how quickly you and your situation heal when you respond to the energies of discomfort and dis-ease from the wisdom and love that exists within your heart. Talk to the symptom directly. Get to know the issue. If there is discomfort, truly become present to it. Face it and literally attune to it. Sense it, feel it, and know it. What does it represent in your life? What is the source? Can you get pictures around it? What are the energies saying? Step one is where you truly attune and listen. You ask specific questions and you become clear. You become present and you recognize the energies that are creating your dis-ease, disharmony, symptom, or issue. How are you reacting to the information coming up? Are you calm? Are you at peace? Are you open to what you are seeing, hearing, feeling, or sensing? Are you filled with victim energy? Are you filled with impatience? Do you have anger or the desire to control? Are you relaxed and willing to open to a new way? In this second step, you are listening to any fight-or-flight reactions that come up from within you to be expressed. You are giving yourself the space to flow and respond instinctively and naturally from any patterns, filters, distortions, or old ways that you hold inside. In this step you are giving yourself the space to get to know all your responses to the energies that are coming up around your symptom, discomfort, dis-ease, or issue. Once you have attuned to the energies of your discomfort, and to the energies responding to your discomfort, you are now aware of the different sides of your issue creating any conflict or contradiction with regard to your symptom. Step three is the time to transcend the different energies of the issue and access your wisdom and love. In this step you make the choice to open to your higher self, to the divine wisdom of your higher consciousness, and to the wisdom and love in your divine heart. This divine shift transforms your reality. You become unplugged from any reaction that you may have toward your discomfort, dis-ease, symptom, or issue. You plug into the divine wisdom, grace, and light that you are. You are beyond your symptom. You are beyond your reaction to your symptom. You are the wise, clear, and loving being that is your divine higher self. As you sense and know the divine aspects of your dynamic, from the perspective of your higher self, divine spirit, and divine heart, you begin to sense more clearly your divine relationship to your symptom. This enables you to understand the larger concept of what is happening and it helps you to see the higher truth of your situation. The divine information gives you the ability to respond now to your symptom and to any reaction that you have to your symptom from a place of pure wisdom, grace, compassion, and unconditional love. You may be used to relating to yourself and your situation from within your old patterns and from within your old ways. You may be used to acting from the survival instincts of primal fight-or-flight. Step four is the time when you respect all fear-based programming and then you act from your divine wisdom and love. You are a divine being of wisdom, love, and light. Healing discomfort is about truly listening to, honoring, respecting, and understanding all sides from your wisdom, love, and light. It is all about being your true authentic self. It is all about being fully present to yourself and your situation, as your true divine I Am. The beauty of this process is really about you being the real you. As we evolve, we go through a process that includes awakening to, expanding into, and integrating the many different aspects of multidimensional consciousness. Spiritual facilitation is helpful during this process to provide clarity, guidance, and support. Through spiritual consulting and healing energy attunements, as a spiritual facilitator, I act as a liaison between the frequencies of spirit and the frequencies of body, emotion, and mind. As a spiritual facilitator, I help in the process of change going on within the person’s consciousness using a bridge technology that allows divine wisdom, clarity, and other healing energies to flow directly into the areas of consciousness that are in need. The technology is based on unconditional love, divine wisdom, the universal laws of energy, divine timing, divine affinity, and free will. During a consultation, I become fully present to the energies of mind, body, emotions, and spirit. I open to divine wisdom, unconditional love, and light. I completely relax and let go and allow that which wants to come up into awareness to come up. On a phone consultation, I have the client begin talking about what they want to talk about. As they talk about what comes up for them, I get intuitions, visions, empathic sensations, and divine wisdom around what is coming up for them or about what is needing to come up. If there are symptoms, I assist in clarifying the emotions and beliefs that are creating the symptoms. I then assist in clarifying the source of any judgments or expectations from the past that are creating discomfort today. I allow the flow of divine wisdom, love, and light at all times and transmit these divine energies to all energies involved. I then guide the process with compassion and grace to completion. During an in-person consultation, I do the same process only I sense with my hands any blocks in flow of a person's energy. Physical touching is not necessary. I sense the energy fields around the body. From this awareness, I can work with the energy that is blocked energetically and bring it into consciousness so the client can become aware of it too. The Divine Heart Website: A place for heart wisdom, healing, and pure unconditional love. Please enjoy my favorite concepts about energy, consciousness, healing, ascension, evolution, awakening, divine relationships, and more. The information that I get from my divine higher consciousness has transformed my reality and my way of life. I hope this information will make a wonderful difference in your life as well. There are so many energies going in so many different directions. Some are in a hurry, while some are going slow. Some are considerate and some are trying to force their way. Many energies of power, control, and force exist outside the speed of love. It is easy to get hurt, overwhelmed, exhausted, and overrun by these energies. The speed of love is the blueprint for the new way. It is the hologram for all vibrations to go at a speed that is love. Consciousness itself is evolving into this new divine flow. Attune to the divine consciousness and sense the speed of love. Take the time to attune to the speed of love. Ask your body, emotions, and mind to attune to the speed that is love. Even if you have no idea what you are doing and you cannot sense anything, simply meditate on the speed of love. This will help your system calm down, relax, and go at a pace that is perfect for all aspects of your being. You are a note within a cosmos of millions of notes. You are a song within a cosmos of millions of songs. Together, you and all the other vibrations of life make up the divine oneness. When you access the divine oneness, you sense and know the harmony of songs. In human form, you can sense and know disharmony. From the place of multidimensional consciousness, you can open to divine oneness and invite aspects of your human self into multidimensional harmony. When things get crazy, open to the divine state of oneness. Visualize, pray, and attune to the speed of love. Sense and become one with the harmony of songs. When you become familiar with the speed of love and the harmony of songs, you begin to feel safe opening. When all aspects of your being are in the frequency of love and going at the speed of love, you open. You open to it all and you are okay. First, attune to love and experience harmony within yourself. Then, open to the love that is all around you and experience a new kind of harmony with those around you. When opening, you may become overwhelmed. You may become confronted by energies of force or power-over that are disrespectful and uncomfortable. Continue to open to and gain access to the energies of divine wisdom, love, compassion, and grace to help you through your internal and external situations. Open to it all at a speed that is love. Get used to being in the pure state of love. Get used to going at the speed of love. Get used to being in harmony multidimensionally - be willing to release that which is not in harmony or alignment with you multidimensionally. Get used to embracing your divine wisdom, love, and light at all times. Embracing all rhythms is another way of opening and creating harmony. Feel the majesty of each note, each song, and each dynamic within the harmony of songs. Begin to sense the joy, the wonder, and the awe of each living pulse. After opening to it all and embracing all rhythms, let it all go. There is no need to hold onto anything. Open to it all, enjoy each experience, and then let go. Let it all go and flow. Divine affinity is divine connection. When you are open to it all and you are not attached to anything, then divine affinity is the power that brings you together in perfect harmony, at the perfect speed of love. When you open to divine affinity, you never have to effort or struggle. Simply relax and allow divine affinity to guide you. You may be used to holding it together with your will. The stronger your will, the more powerful you have been. You set up tests of will, battles of will, and other games of will. This has been an amazing way of being. You have created many things by taking aspects of reality and shaping it with your will. There comes a time when the game simply loses its joy. There comes a time when the battle between wills becomes boring. There comes a time when trying to hold it all together with the will becomes exhausting. There comes a time when you simply evolve your consciousness and open to a new way of being. When you open to the next level of existence, you don't have to will yourself anymore. You relax your will centers, let go, open to it all, and allow divine affinity to work with you and through you. It may take some time to help your will centers to relax. They are used to protecting you. They are used to keeping up the fight-or-flight dynamic for your survival. What an amazing job your will centers have done. There is nothing wrong with doing a great job surviving. Today, you get to move beyond survival. Today, you have the opportunity to help your will centers relax and open to the divine. You can help your primal aspect of consciousness to connect with the energies of divine wisdom, love, and light. With this new connection, you have a new purpose that is beyond survival. You now get to truly live in peace, harmony, joy, and unconditional love. Expanding beyond duality happens when you expand your mind past your dualistic thoughts and into the thoughts of your divine higher consciousness. In this divine consciousness, you move beyond all forms of judgment. You move beyond right and wrong. You move beyond good and bad. You move beyond rules and roles. You truly let go and expand your consciousness into an entirely new place of being. Does this mean you live in total chaos? When you let go of all judgment and move beyond the polarized consciousness of good and bad, right and wrong, and all dualistic thought, you move into a state of pure divine being. You open to it all and you allow your true divine essence to guide you from a higher place of divine wisdom, unconditional love, and divine knowing. The divine transformation is the completion of the old way and the creation of the new way. It is an expansion beyond a fixed conceptual reality. It is the shift into a new multidimensional awareness of what is. You are a part of this project. It is a massive step to open beyond the rules, roles, programs, and structures of conceptual thought. It takes courage and grace. It is all about divine timing. You do not have to effort. Relax and allow what is happening to happen. You are aware of your emotions. You are aware of your mental structures, concepts, rules, and roles. 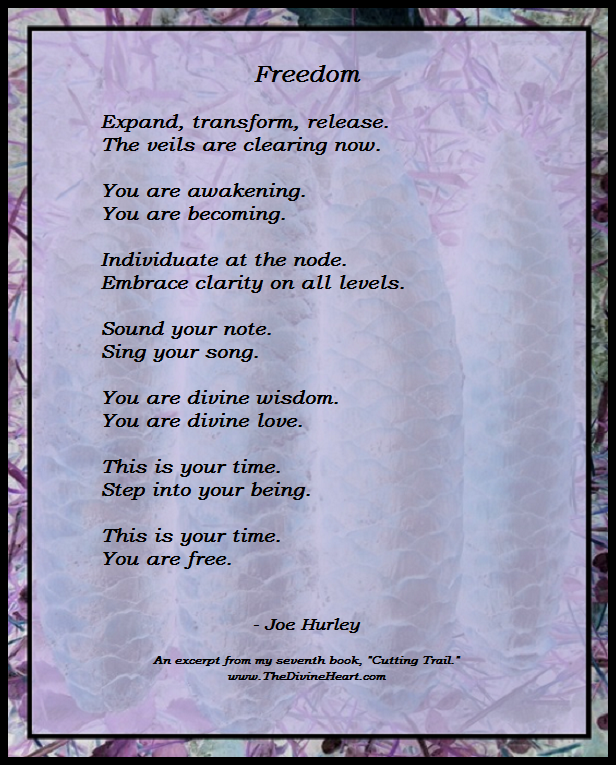 Now, with this step, you are awakening to the world of intuition, spirit, and divine essence. You are opening to your true and authentic I Am. The divine transformation is the project of taking your consciousness, (body, emotion, and mind) into awareness of this new way of being that exists beyond the physical, emotional, or mental. You are expanding and reconnecting your human systems with the higher vibrational realms of your spirit essence and the divine. As you open to your true and authentic divine I Am and bring your spirit essence into your human self and situation, your whole self is honored and respected in a new way. You individuate from all that is. You differentiate from all that you are not. You begin to love and care for yourself on all levels. You begin to honor and respect each aspect of your true whole self. When the mind is overwhelmed, open to your heart. When the heart is overwhelmed, open to your divine heart. At different times in your evolutionary process, you have followed your body instincts, you have responded to your emotional impulses, and you have willed your way through reality from the place of your mind. Most of the time your heart had to be shut off or disconnected from the process. Now it is time to reconnect all aspects of your being with your heart. Reconnecting fully to your heart can hurt. The best way to reconnect all aspects of your body, emotions, and mind with your heart is to open to what hurts and then connect with your divine heart. Your divine heart is the higher vibrational aspect of your human heart. It is the higher vibrational aspect of your core being. Your divine heart operates at the speed of love. Your divine heart operates within the harmony of songs. Your divine heart embraces all rhythms. Your divine heart is open to it all and lets it all go. Beyond duality, beyond will, beyond attachment, and beyond control, your divine heart is simply connected to all that is in a higher vibrational way. As you learn to reconnect, simply open your heart and experience what is there. Now open to your divine heart and connect with the pure divine wisdom and pure unconditional love that is the real you. An excerpt from my book, "Arc of Being: Volume 7." Get a copy of "Arc of Being: Volume 7" at Amazon here! There is a new trail being cut for those experiencing pain and suffering. A new trail is being cut through the discomfort, allowing the space for love to flow and divine essence to come fully alive within the self and within each situation. This is a time of new awakening. This is a time to step fully into a new way of being. This is a time to fully experience the energies of happiness, joy, divine wisdom, and pure unconditional love in everyday life. How much of yourself are you willing to see? How much love are you willing to experience? Are you ready to step into a totally new way of being? Are you ready to experience being pure love, divine wisdom, and total joy? Are you ready to step into you? An excerpt from my book, "Cutting Trail." Get a copy of "Cutting Trail" at Amazon here! There are waves washing over you each moment. These energy pulses of higher vibrational information are telling you something. Often there is resistance to knowing this information. The walls go up and there is a defending of the old ways. The unfamiliar can be scary. When you resist, there is discomfort. Reaction to discomfort creates more discomfort. Eventually your struggle turns to surrender and you let go. You open up to the waves. You awaken to new information. Each wave is one of an endless flow of many. Each pulse carries information with a purpose. Each piece of information is designed to bring clarity and direction to a world unfolding. As you accept the wisdom of the waves, your illusions crumble. Your pain is faced and released. You reconnect with the whole. attune to the wisdom of the waves. The waves are here to help. An excerpt from my book, "Parables of Light." Get a copy of "Parables of Light" on Amazon here! Awakening is the evolutionary process of expanding awareness. There is no beginning or end to the process of awakening. Sometimes the awakening process is accelerated. An accelerated series of awakening steps happened to me right after I let go of processing reality in terms of duality. I let go of seeing life in terms of right or wrong. I let go of seeing life in terms of good or bad. I allowed my mind to transcend the dualistic way of thinking. Letting go and transcending was a process. Each time I let go and transcended my old way of thinking, I would go into a space of emptiness and darkness. I would experience the unknown. The dark and empty unknown was scary, but I stayed present and faced my fear. Over time, I realized that I was not hurt by the fear. I was not afraid of the fear. In fact, I had no problem simply being in the unknown, opening to the fear, and listening to my senses. As I listened and sensed from a place beyond duality consciousness, beyond the ego, and beyond the mind, I became fully present to something truly amazing - I discovered a larger, expanded, divine reality. In the stillness of my being, within my expanded state of consciousness, while fully present to the dark and empty unknown, the subtle energies of higher consciousness came alive. There were many unique aspects of divine reality being shown to me. The most powerful experience came when I suddenly realized that I could sense, feel, and know my own divine essence. This is when I began to truly believe in my unique higher self. Over time, with each new experience transcending my mind and going into the space of expanded consciousness, it became easier for me to be present to, listen to, and sense my spirit essence. It became easier for me to sense, feel, and know my divine wisdom, love, and light. It became easier for me to be present to, listen to, and sense the divine in those around me. Today, I continue to listen to, sense, and be present to what exists within my physical, emotional, mental, and spiritual aspects of self. I continue to awaken to many new levels of consciousness. And with each new step of awakening, I know with more wisdom and clarity that we are each divine beings of wisdom, love, and light. What really happens when you open to your divine flow? You may become hyperaware and supersensitive. You may notice new levels of joy and happiness. You may experience new sensitivities to light and sound. You may feel impacted by a sudden awareness of energetic blocks and restrictions to your flow. Awareness is different during the initial stages of awakening. You may become aware with intense clarity of the people and systems that help you. You may become agitated with people that create problems for you. You may sense with amazing wonder the awe of life around you. You may become overwhelmed with a deeper awareness of pain, suffering, loneliness, and despair. You may awaken gently and slowly over long periods of time. You may awaken quickly and intensely through one or more transformational events. You may go deep into your process and bring up complex dynamics to clear. You may expand outward and go into the divine realms to discover new levels of wisdom, love, and light. No matter how you open to your divine flow, as you embrace your awakening you gain a deeper confidence in opening to life. You gain the ability to see, sense, and know the wholeness of life that exists beyond the limits and illusions of standard thought. You gain a deeper awareness of your true divine essence and you begin to fully realize and accept that you are a true source of divine wisdom, love, and light, right here in human form. As the dark clouds reach an ominous peak, the pouring of rain turns to mist. From a distance, millions of unique strands of golden light emerge, illuminating the sky. Suddenly, a magnificent rainbow appears with its grand arch of pristine color stretching from one end of the earth to the other. The angels appear bringing wonder and joy, as they hover and dart playfully in the colorful mist. Soon other light beings arrive and join in the celebration. In human form we awaken, participate in, and co-create the beauty manifesting all over the earth. Our spirits dance and we experience what it means to be alive. An excerpt from my upcoming book The Man Who Walks With Angels.